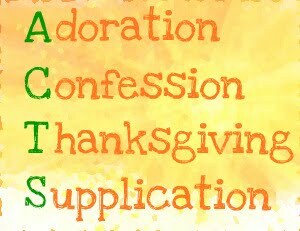 Yet another acronym for prayer, this study method is very popular, in part because of how easy the acronym is to remember. Spend time praising God. This pushes our earthly concerns to the periphery and refocuses us on the love, power, and care of God that we believe in. Attempting to be thankful can reveal the real state of our heart, uncovering our hurts and bitterness. But if we forsake them through allowing ourselves to shift towards being truly thankful for Jesus’ and his provision for our sins and a future of eternal life, goodness can fill our souls again. Also, this is the time to pray for others. For a good overview of this, see How to Pray the Lord’s Prayer, Section 2 (“Thy Kingdom Come”).